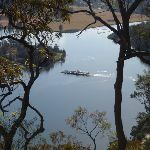 Wisemans Ferry village is on the banks of the Hawkesbury river, NSW. The town, and nearby car ferry, is named after Solomon Wiseman, a former convict who received a land grant in the area and established the ferry service. 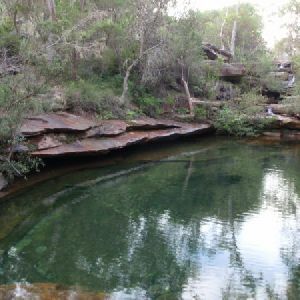 The town is a popular day trip and weekend destination from Sydney. 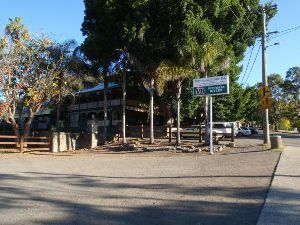 There are several good spots to eat in town, including bistros at the Wisemans Ferry Inn and the Wisemans Ferry Bowling club, and takeaway food from Bush Bites cafe. The Riverbend Restaurant can be found in the ‘Retreat at Wisemans’ for finer dining. 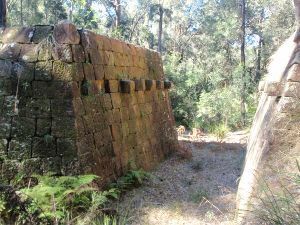 The area has some great walking and interesting history surrounding the convict built Old Great North Road. More info. 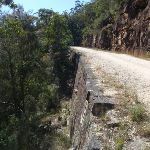 The historic Great North Road was built using convict labour between 1826 and 1836 (this section south of Wollombi was completed in 1832). 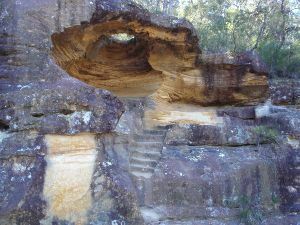 The road formed a link between Sydney and the Hunter Valley, including Newcastle. 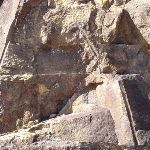 There are visible remnants of the original work in bridges, retaining walls and other structures along the way. 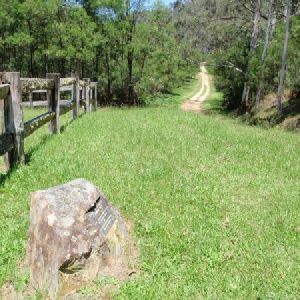 The ‘Convict Trail Project’ has member groups involved in the conservation of historical remnants along the road. 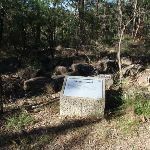 The Convict Trail Project and the NPWS have erected information signs at various points to illustrate the history. 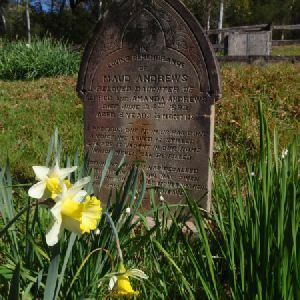 The Convict Trail Project has an excellent website for further reading. More info. 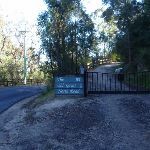 From the car park and intersection on Wisemans Ferry Rd (about 500m west of the car ferry), the walk passes around a gate, passes an information sign, and follows the ‘Old Great North Road’ up the hill. 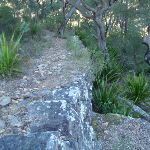 This section of the walk winds up the hill, passing numerous cuttings and retaining walls built with convict labour. There are several information signs on the way, making the walk more interesting. 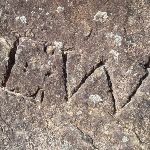 The walk then arrives at the signposted “Hangman’s Rock”. 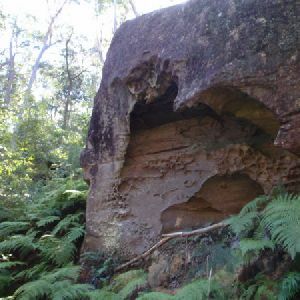 Hangmans Rock is beside the historic Old Great North Road, near Wisemans Ferry, NSW. 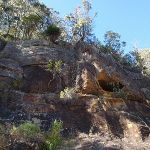 This beautiful sandstone cave/overhang has some steps and a bench seat cut into it and is part of the history of the convict built OGNR. 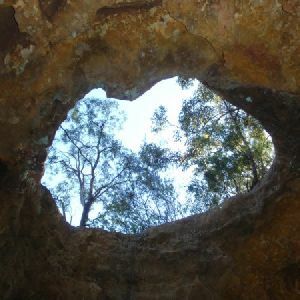 It is uncertain what purpose the spot served, but stories that convicts were hanged through the hole in the roof of the cave appear unlikely to be true, despite giving a name to the atmospheric spot. More info. 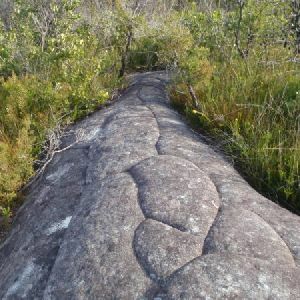 Continue straight: From Hangman’s Rock, the walk follows the management trail gently up the hill. The trail bends back and forth as it gently climbs. Another information sign indicates the probable site of a stockade to hold the “more troublesome convicts”. A little further along, the walk passes around a gate and reaches the intersection with “Shepherd’s Gully Road”. There is another information sign at this intersection. Veer right: From the intersection, the walk follows the ‘Finchs Line 500m’ arrow along the management trail, soon passing a culvert information display. The trail continues further up the gentle hill to reach the signposted intersection with the ‘Finchs Line’. Turn right: From the intersection, the walk follows the ‘Finchs Line’ arrow along the management trail. This long meandering section is quite interesting with a nice variety of forest scenery and remnants of the road construction. 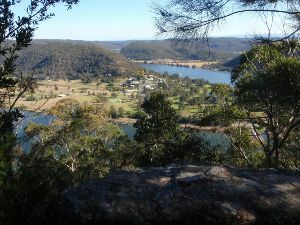 There are also frequent glimpses of the Hawkesbury river and Wisemans Ferry township through the trees. 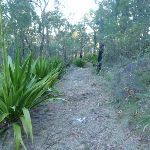 The walk eventually comes to an unmarked intersection with a bush track (with the management trail bending to the left). 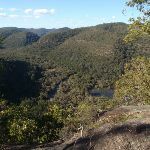 Continue straight: From the intersection, the walk follows the bush track gently down the hill a very short distance to arrive at an informal, unfenced lookout with stunning views across Wisemans Ferry and the Hawkesbury river. At the end of this side trip, retrace your steps back to the main walk then Turn sharp right. 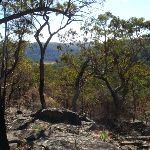 This informal, unfenced (and unnamed) lookout is just off the walking track along the historic Finchs Line Road, near Wisemans Ferry, NSW. 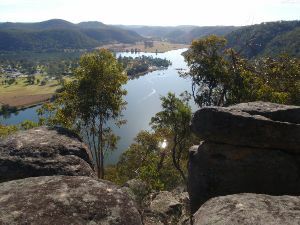 There are beautiful views down across the Hawkesbury river and Wisemans Ferry township from here. Veer left: From the intersection, the walk follows the management trail steeply up the hill. 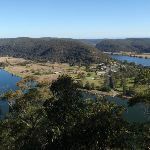 This section of walk meanders for a while, passing an information sign about the ‘Abandoned’ works on the Finchs Line, before coming to a series of spots on the right with beautiful views down across the Hawkesbury river and Wisemans Ferry township. The walk continues along these viewing spots to the large rock outcrop, on the right, just as the trail bends to the left and heads away from the cliff line. 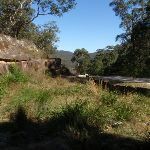 This informal, unfenced (and unnamed) lookout is on the trail along the historic Finchs Line Rd near Wisemans Ferry, NSW. 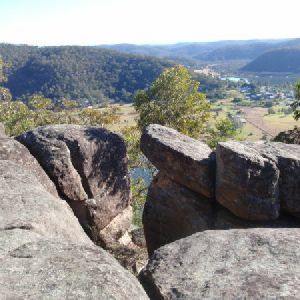 The viewpoint sits on a beautiful outcrop of boulders and provides stunning views down across the Hawkesbury river and Wisemans Ferry township. 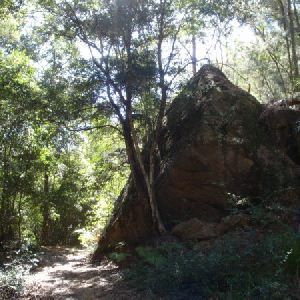 Continue straight: From the rock outcrop, the walk follows the management trail away from the cliff line. The trail switches to the other side of the ridge and offers some beautiful views across the valleys behind. 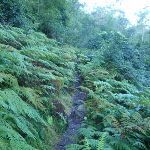 The trail starts to drop reasonably steeply and arrives at a junction with a bush track, marked with a sign indicating bikes must be walked. 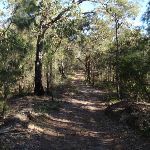 Turn left: From the signpost, the walk follows the bush track as it zigzags down a steep hill, along the path of Finchs Line road. 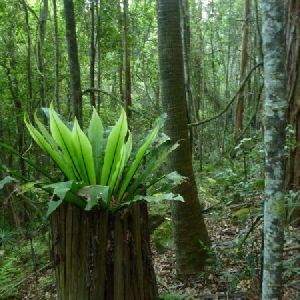 There are some beautiful views away from the track and a lot of ferns, grasstrees and vines surrounding the track. 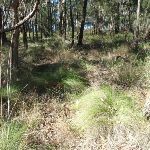 After winding down the hill for quite a while the walk arrives at the intersection with Wisemans Ferry Rd, signposted with ‘Finchs Line Walking Track’ (about 1.8km east of the car ferry). 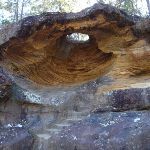 Continue straight: From the intersection (about 1.8km east of the car ferry), the walk follows Wisemans Ferry Rd, immediately passing a noticeable sandstone gateway to the left. 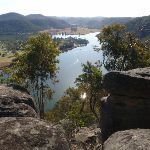 The road continues, with the Hawkesbury river to the left, and some great views of the cliffs to the right, for quite a while before reaching the northern end of the car ferry (Wisemans Ferry), signposted as the ‘Gosford Approach’. 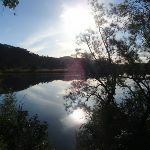 Continue straight: From the northern end (Gosford approach) of Wisemans Ferry, the walk follows Wisemans Ferry Rd, keeping the river to the left. The walk soon arrives at the historic Thomas James Bridge. 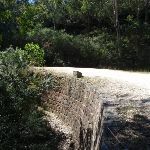 The historic Thomas James Bridge is on Wisemans Ferry Rd, NSW. 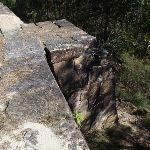 This is the oldest in-use bridge on mainland Australia (Tasmania has older bridges) and is one of several convict built bridges along the Old Great North Road. The bridge was built during 1830 (the timber deck is more recent) and was named after the overseer of ‘Road Party 25’ which built the bridge. More info. 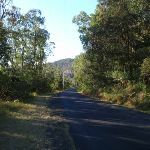 Continue straight: From the bridge, the walk follows Wisemans Ferry Rd gently up the hill for a very short distance and arrives at the car park and intersection with The Old Great North Road (about 500m west of Wisemans Ferry crossing). 5km of this walk has gentle hills with occasional steps and another 3km has short steep hills. 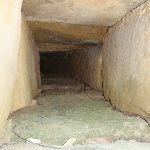 The remaining (1.8km) is flat with no steps. 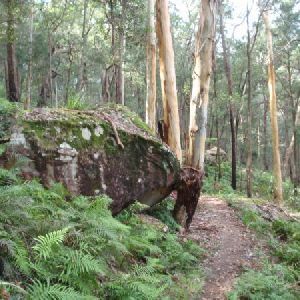 6km of this walk follows a clear and well formed track or trail and another 2.5km follows a smooth and hardened path. 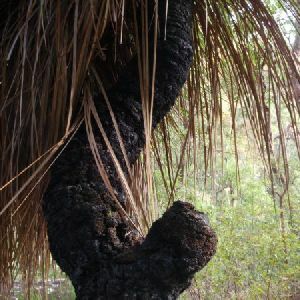 The remaining (1.2km) follows a formed track, with some branches and other obstacles. Around 5km of this walk has directional signs at most intersection, whilst the remaining 4.7km is clearly signposted. 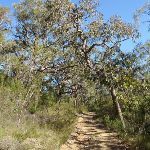 Around 9km of this walk requires no previous bushwalking experience, whilst the remaining 1.2km requires some bushwalking experience. Around 7km of this walk has limited facilities (such as not all cliffs fenced), whilst the remaining 2.4km is close to useful facilities (such as fenced cliffs and seats). 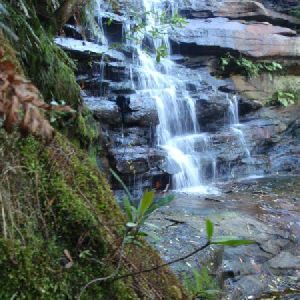 A list of walks that share part of the track with the Devines Hill and Finchs Line circuit walk. 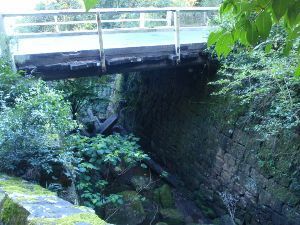 A relatively short walk with some really nice scenery and some of the historic highlights of the Old Great North Road. 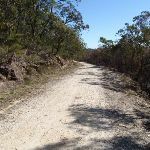 This walk climbs part of the well formed Devines Hill ascent. 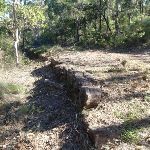 The remnants of the convict built road are impressive and there are good information signs along the trail. 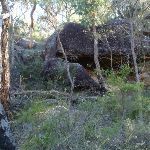 The visible remnants of the Old Great North Road include rock cuttings, stone retaining walls, an old quarry site and Hangmans Rock. 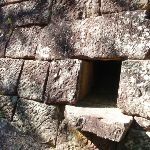 A great walk with some really nice scenery and plenty of history. 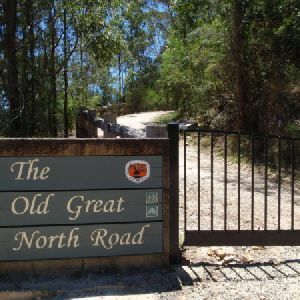 This walk follows the well formed Devines Hill ascent portion of the Old Great North Road. 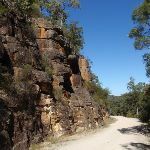 The convict built road is impressive and there are good information signs along the trail. 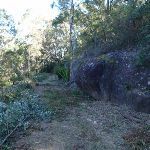 The visible remnants of the Old Great North Road include rock cuttings, stone retaining walls, an old quarry site and Hangmans Rock. It is also worth the very short walk down the hill from the start of the walk to have a look at the historic Thomas James bridge. 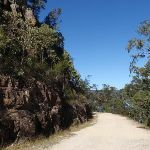 A great one-way walk which offers some beautiful scenery in the moist and shaded parts of Shepherds Gully, some bigger views on Devines Hill and plenty of Old Great North Road history. There are plenty of information signs along the way giving some good background on the convict build roads, making the walking more interesting. 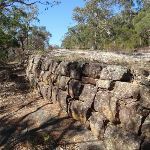 A short walk along Wisemans Ferry Rd from the end of the walk will also get you to the Thomas James Bridge, the oldest in-use bridge on mainland Australia. 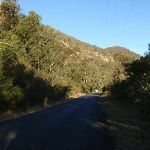 The long, gentle climb along Shepherd’s Gully has some beautiful scenery and some historic remnants of the Old Great North Road. While the remnants of the road construction are not as impressive as those on the main Devines Hill ascent, they are still interesting. 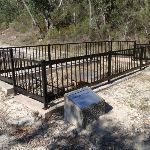 The optional side trip to Hangmans Rock takes you past an old convict stockade site and some of the construction remnants on the main Devines Hill ascent. 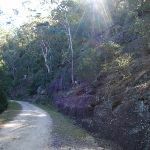 This pleasant walk follows part of the historic Finchs Line road, the original route for the Great North Road up the hills just north of Wisemans Ferry. 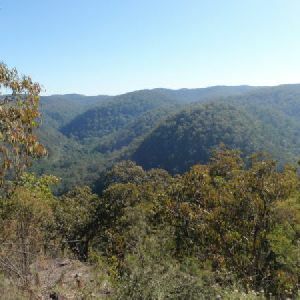 The walk starts in moist, fern covered scenery and climbs to drier forest and some stunning views over the Hawkesbury river and Wisemans Ferry area from the unfenced Finchs Line viewpoint. There are other great views along the way too. 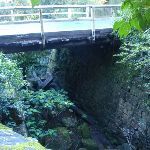 A list of walks that start near the Devines Hill and Finchs Line circuit walk. A beautiful walk along part of the 11km Circuit walk, climbing up through a beautiful moist gully before emerging to drier forest and a nice viewpoint. 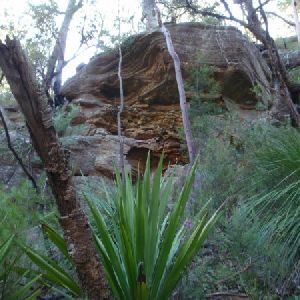 The walk provides a great variety of scenery with a mixture of vegetation and some great boulder and cliff scenery along the way. The climbs and descents are pretty steep at times but not too long. 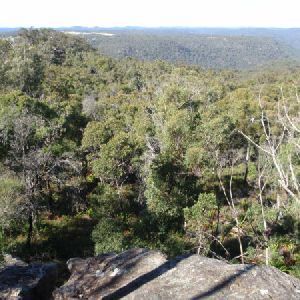 This beautiful circuit walk goes through a range of dry and wet forest along the valley, and offers some great views. 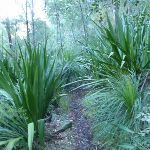 There are plenty of grasstrees along the way to add to the scenery and the creek crossings are very picturesque. The optional side trip adds some beautiful rock overhangs to the scenery and gives a taste of the scenery on the longer 11km Circuit walk. 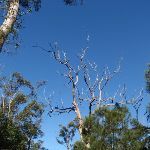 http://new.wildwalks.com/wildwalks_custom/includes/walk_fire_danger.php?walkid=nsw-dharugnp-dhaflc Each park may have its own fire ban, this rating is only valid for today and is based on information from the RFS Please check the RFS Website for more information.